The ROG STRIX Fusion 500 is a headset offering unparalleled style and incredible sound from the STRIX Fusion product series that also brings together the comfort of wireless headsets with the performance demanded by high-end gaming. With its 50 mm drivers, innovative closed-style construction, seamless design and virtual 7.1 surround sound, it undoubtedly fulfils every criteria necessary for an incredibly immersive soundscape. The soft ear cushions as well as the relatively low weight also help to keep the headset comfortable over the course of length gaming sessions. This versatile closed-style headset actively prevents outside environmental noise from getting in the way of your game. For that reason, this headset is perfect for gamers that like to focus fully on the game before them while helping to block out unwanted noise. The ASUS ROG STRIX Fusion 500 utilises specially sealed earphones which, in conjunction with the rich acoustics of the drivers, produce an exceptionally impressive and detailed sound. This is also due in no small part to the ESS ES9018 DAC with lossless 24-Bit/96kHz output which is paired with a SABRE9601K amplifier for powerful bass notes . Developed exclusively by engineers at ASUS, the 50 mm neodymium magnet speakers deliver a powerful yet accurate sound in both games and films. Music and voice reproduction also benefit greatly from the technology used in the ROG STRIX Fusion 500. The extendable unidirectional digital microphone automatically mutes itself when retracted. A touch control on the headset allows user control over the volume, playback and RGB synchronisation. The wide headband is sturdy yet light and combines with the pivoting earphones of the ROG Hybrid to enable long-lasting comfort. Users looking to take that comfort to the next level can look to the swappable ear cushions that enable cushions with different materials to be used. The ROG STRIX Fusion 500 is, thanks to its USB connection, compatible with PC, Mac and PlayStation 4. Last but not least, ASUS rounds out their headset with RGB-LED lighting which can also be controlled using Bluetooth via the mobile app. All in all, the design of the ROG headset is at once futuristic while uncompromising in its choice of materials, construction and comfort. 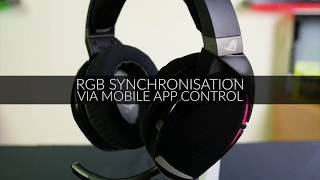 More links for "ROG STRIX Fusion 500 7.1 Surround RGB Gaming Headset (PC/PS4 90YH00Z2-B8UA00)"